Kings continue on the Togiak, very impressive late season chrome Chinook still coming in. 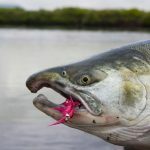 Some Salmon grand slams have also materialized on the Goodnews with the arrival of some fresh coho rounding out the Pacific five species, king, pink, sockeye, chum, and coho. Chums are in heavy spawn right now and the bead action is really getting good for all resident species .